The event is intended to gain feedback from "potential users" to glean insight on how to improve their products to help launch it in the real world. "What we do is essentially building businesses by finding a problem, and then executing a solution," Tsubasa Konishi, vice president of marketing for D3, said. "With an organization like D3, there is opportunity for immediate and long-term growth starting at our home, OSU, which will expand into the world for the better." 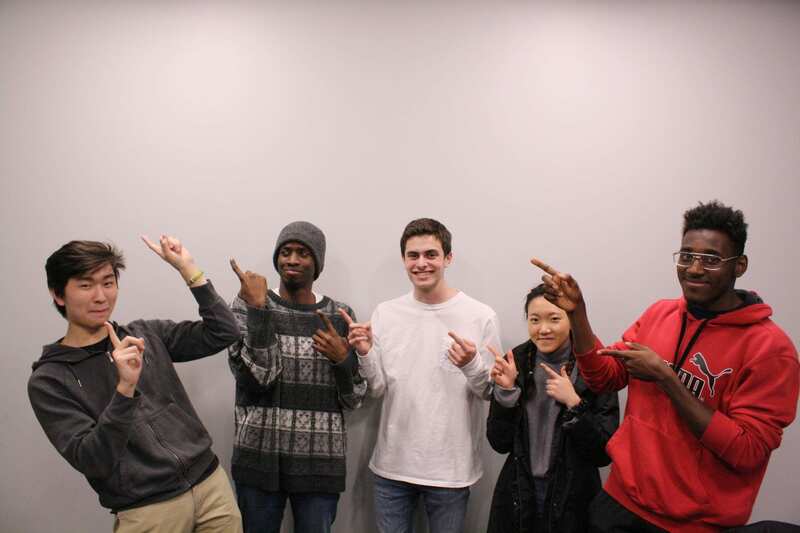 "At Demo Night at the end of the semester after all of our hard work, having a validation source from such a prestigious company was a shining moment for me," Konishi said. "With OSU having some of the country's brightest students, we understand that many students have an idea in the back of their mind that they have the ability to bring to real life if they put the effort into it," Konishi said. "[D3] is the only organization at Ohio State that provides opportunity and value no matter what your skill set may be," D3 president Michael Radey, said. "If you can identify a problem in the world, D3 will have a group of hardworking people motivated to help you solve it and make an actual impact in society." "Over the years, [D3 has] helped me meet a diverse group of people and hear ideas that I would never have heard in a classroom," Radey said. "[D3 has] challenged me to not be afraid of failure and have confidence in my own work." Demo Night will be held from 6:15 to 9 p.m. on April 13 in the Ohio Union's Reflection Room. D3 encourages anyone interested to attend as they will also provide dinner and prizes for attendees. HOLYOKE, Mass. (WWLP) - The organization SPARK EforAll held a pitch contest for food entrepreneurs in Holyoke Wednesday night. Breweries, bakeries, and vegan chefs came out to the HCC Culinary Institute to pitch their business ideas, and have the chance to win prize money. Local food entrepreneurs served as the judges, including owners from Holyoke Hummus Company and Fernandez Family restaurant. "What we're trying to do is build a community of people who support entrepreneurs, who are entrepreneurs, and are looking for a network and a community of support," said Tessa Murphy-Romboletti, SPARK EforAll executive director. The first place winner of the pitch contest won a $1,000 prize, $750 for second place, and a $500 prize for third place and the fan favorite. Ithaca College held its first 3 Day Startup, an event that provided students with the chance to participate in a fast-paced group project, allowing them to practice pitching business ideas. The event was funded by the Roy H. Park School of Communications and lasted from April 5 to April 7. The event occurs in other schools nationwide. It was founded by a group of students in Austin, Texas, in 2008 and has since spread across many higher education institutions around the world. Shayna Dunitz '13 is the director of operations at 3 Day Startup in Austin and worked directly with senior Lauren Astor to help facilitate the event. During the event, 25 students had the opportunity to practice coming up with business startups, present them to a panel of judges and receive feedback on their pitches. The panel consisted of Tim Reynolds '14; Deborah Hoard, president of Photosynthesis Productions, a media production company based out of Ithaca; and Bill Guerrero, vice president for finance and administration. In the end, the groups walked away with more knowledge on how to start their own businesses. The event consisted of five student groups, named Good News, Morning Boost, CartSmart, Traverse and VeRiFID. The pitches all focused on ways to help make students' lives easier. Each group had a total of five minutes to present their product idea to a panel of three judges. After each group had five minutes to present, the panel took five minutes to provide feedback. This is not the first event that students from the college have participated in to pitch ideas and products. Rev Ithaca Startup Works holds an annual event in downtown Ithaca in which student groups have the chance to win funds for their business ideas. At 3 Day Startup, senior Elena Piech and her group came up with an idea to make learning a language easier by connecting students with the respective culture through virtual reality goggles. Piech said her main goal was to gain business experience from the event. "As a student in the Park School, I feel like I do not get a lot of exposure to the business world," Piech said. "I wanted to participate to gain more business and startup skills, especially because I am really interested in working in the technology space in the future, and the startup culture is really ingrained in the space." Senior Stetson Doggett and his group came up with the idea for CartSmart, an application that compares prices at nearby grocery stores to find the best deal. Doggett said that through the three-day event, his team learned how to figure out how to appeal to a certain market. "We learned what the potential is for growing an idea and establishing it as a business," Doggett said. The Good News group addressed the accuracy of news by making a Google Chrome extension that would provide users with background information on the website they are visiting, like who the owner of the website is and how long they have owned the website. Morning Boost was pitched as an on-campus breakfast delivery service that would only provide two breakfast sandwich options and two coffee options to make deciding on food easier and less stressful for students. This food service would also help to bring jobs to students on campus. VeRiFID was a group of students that consisted of communications and film majors as well as students employed at the Park Portable Equipment Center and Services. This group had the idea to implement radio frequency identification into camera rental equipment shops around the world to make the process for workers and clients faster and more efficient. Astor said she thought the event went well and the participants were engaged in creating business proposals. She said there were many people that helped make this event happen, and with a group effort, this idea was able to become a reality. "I've developed an interest in event management over the last year, so I produced 3 Day Startup as my emerging media senior capstone project," Astor said. "Our participants were passionate and worked hard over the weekend to develop impressive startup ideas." General Insurance of India (GIC Re) is India's largest reinsurance company. Owned by the government of India, it accounted for around 60 percent of the premiums passed on by Indian insurers to reinsurers during FY18. With growing international presence, the company is now the 10th largest reinsurer in the world, based on net premium as per Standard & Poor's. While there is inherent volatility in the risk-underwriting business, GIC Re is the only listed reinsurer, making it a stock worth looking at. The Indian reinsurance market, estimated to be around Rs 48,000 crore as at FY18-end, has witnessed a compounded annual growth rate (CAGR) of around 16 percent in the past 10 years. Most reinsurance premiums written in India comes from the non-life segment (an average of more than 95 percent in the past five years). Hence, future growth in reinsurance premiums is contingent on growth in the non-life insurance segment as well as percentage of premiums passed on to reinsurers. We see high-teen growth (16-17 percent) for the non–life insurance sector over the next few years as market is grossly underpenetrated and there are multiple growth levers for sub-segments like motor and health insurance. Thanks to the growing overall pie of non–life premium, reinsurance premium stands to increase even though proportion of premium retained by non-life companies is also rising. Crisil expects reinsurance premiums in India to increase 11-14 percent CAGR over the next three years to Rs 70,000 crore by FY22. Until recently, GIC Re was India's only domestic reinsurer. However, the recent change in regulations enabled foreign reinsurance companies to compete in India. At present, 11 reinsurers operate out of India. In addition to GIC Re, nine are foreign reinsurers (Lloyds, Swiss Re, Munich Re, SCOR SE, RGA, Hannover Re, XL Catlin, Gen Re et al) and the other one is a private Indian reinsurer: ITI Re. Granted license in FY17, ITI Re is yet to commence the business. All direct insurers in India are required to cede a minimum five percent of their every non-life policies premiums to GIC Re. This minimum rate of cessions has been falling from 20 percent initially to 15 percent in FY06, to 10 percent in FY12 to 5 percent in FY13, where it remains currently. These obligatory cessions in a way guarantees business to GIC Re. That said, obligatory cessions may also require GIC Re to reinsure unprofitable business. For example, the company is required to accept five percent of third-party motor insurance risks in India, which has historically had high losses. Under regulations set out by the Insurance Regulatory and Development Authority of India (IRDAI), insurers are required to offer business to GIC Re first. The regulator recently relaxed the norms for foreign reinsurers that have set-up shop in India, but retained the right of first refusal for the state-owned GIC Re. If the latter declines to accept the risk, only then it would be given to the branches of foreign reinsurers. However, to drive up competition in the market, which is currently dominated by GIC Re, regulations allow insurance companies to simultaneously seek terms from at least four foreign reinsurance branches. If the Indian reinsurers cannot match the rates quoted by their foreign counterparts, then they stand to lose business. The step likely to trigger intense competition in the country's reinsurance space, but GIC Re still has an advantage. 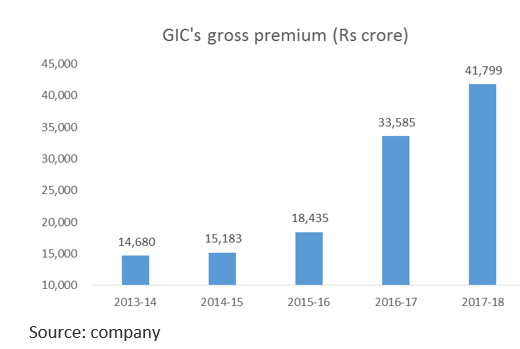 GIC Re witnessed an around 71 percent CAGR increase in domestic gross premium between FY16 and FY18, driven by crop insurance, following the introduction of Pradhan Mantri Fasal Bima Yojana (PMFBY), the government's push to raise the country's insured crop area. For 9M FY19, overall growth in gross premium moderated to 8.6 percent due to normalising crop insurance growth for non-life companies. Growth was mainly driven by its international business, which constitutes around 27 percent of total gross premium. Going forward, we can expect a low double-digit growth in premium driven by its overseas business. Despite strong premium growth, the reinsurer reported an underwriting loss in FY18 and also in 9M FY19. The combined ratio, measure of insurance company's profitability expressed as total cost to total revenue, stood at 107.6 percent for 9M FY19. The weak combined ratio was mainly on the back of higher claims/loss ratio at 92 percent, while the commission and expense ratio was slightly better at 15.2 percent. Consistent and favourable investment income more than offsets the underwriting loss. As a result, the reinsurer reported a profit of Rs 1,621 crore in 9M FY19. Solvency ratio, at 184 percent, was comfortably above the regulatory requirement of 150 percent. This, along with the double-digit return on equity (RoE), should help maintain growth for the next couple of years before having to raise fresh capital. Being the leader in reinsurance in India, GIC Re has competitive strengths in terms of strong underwriting and actuarial capabilities. It is well poised for growth, with an increase in insurance penetration, focus on profitable segments and improvement in operating efficiency. Though we are comfortable about GIC Re in the long run, the stock will react to its underwriting performance in the short term and could be volatile. The counter is already down more than 30 percent from its 52-week high and is currently trading at two times its trailing book. With FY20 RoE estimated at 12-15 percent, the current valuation looks reasonable. In the absence of a comparable listed peer, GIC Re trades as a proxy for the sector. Investors with a long-term horizon and wanting to participate in the growth in the reinsurance sector can consider this stock. You are subscribed to email updates from &quot;company ideas&quot; - Google News.